Slip and fall accidents can and do happen. Sometimes we are at fault and sometimes the property owner is at fault. In general, a property owner owes you a duty to use reasonable care to protect you from injury while you are on their premises. This includes a duty to protect you from anything that might cause you injury. Typically, in a business setting such as a grocery store, this means that the owners and managers of the store must take reasonable steps to protect you from slippery floors, broken stairs and the like. If they fail in their duty and you are injured because of their negligence, you may have a legal claim against the store. And for that you will need the services of an experienced Okmulgee slip and fall attorney. This area of law is called premises liability, and it has grown out of what is known as “common law” as opposed to case law. This area of the law can be complex as differing standards of care may apply. To find out if you are entitled to damages for your slip and fall, call the Okmulgee slip and fall attorney at Wirth Law Office – Okmulgee at (918) 756-9600 or toll-free (888) Wirth-Law. What is Premises Liability and How Does it Affect Slip and Fall Liability? Slip and fall cases turn on the issue of duty. One of the primary elements of a claim for negligence against a property owner (or tenant, or occupier) is that of duty. An owner has a duty to take reasonable steps to keep you safe. But in Oklahoma, the duty owed varies according to the classification of the injured party. For example, the duty owed to an invitee is far different than that owed to a trespasser. An invitee is a person invited to the premises for a commercial purposes. That includes people coming to a store or the like. A person invited for social purposes is called a licensee. For example, that would include friends that you invite to dinner. A trespasser is an interloper on the property who arrives with no express or implied invitation. 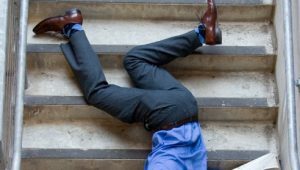 Under the law, the duty owed to each of these classifications is slightly different and those differences are important in determining liability in a slip and fall case. Trespassers are owed the least amount of duty. An owner has only a duty to avoid willfully or wantonly causing injury to the trespasser. For a licensee, the owner has a duty to exercise ordinary care to let the licensee know of the existence of any dangerous defects or conditions at the property. The duty to an invitee is higher. It includes the duty of exercising reasonable care to make sure that the property is kept in a reasonably safe condition for the invitee to enter and conduct business. However, the landowner does not owe a duty to protect the invitee from dangers that are so apparent or easily observable that one could reasonably expect them to be discovered. This “open and obvious danger” defense is one that business owners have long depended on. If the danger is so open and obvious that a reasonable person should have noticed it and steered clear of the danger, then the injured person should have done so. This area of the law is highly complex and highly fact bound. Duty can be affected by the level of knowledge the person coming onto the premises has regarding the conditions on the property, the frequency of the person’s visits and the like. The issue of duty is a fundamental and complicated one that must be answered in any liability analysis. Because premise liability law in Oklahoma tends to favor property owners, the services of an Okmulgee slip and fall attorney can be helpful if you’ve been injured on someone else’s property. If you’d like a confidential, no cost consultation with an Okmulgee slip and fall attorney, call (918) 756-9600 or toll-free (888) Wirth-Law for a free consultation at the Wirth Law Office – Okmulgee. Or, enter your legal question or concern in the firm at the top right of this page, and one of our attorneys will email or call you.